Falcon Class Motor Minesweeper: Laid down, 26 February 1954 as AMS-193 by the Quincy Adams Yacht Yard, Quincy, Mass. 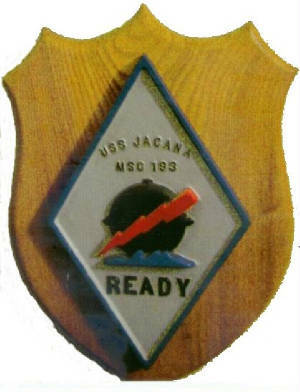 ; Redesignated as a Coastal Minesweeper MSC-193, 7 February 1955; Launched, 25 February 1955; Commissioned USS Jacana (MSC-193), 10 March 1955; Decommissioned, (date unknown); Transferred to Indonesia, 1971 and renamed Pulau Aruan (M 718); Struck from the Naval Register, 1 May 1976; Sold, 1 September 1976. Specifications: Displacement 362 t.; Length 144' 3"; Beam 27' 2"; Draft 12'; Speed 13.6 kts; Complement 39; Armament single 20 MM AAW cannon mounted on the forecastle and a small arms cache that included a BAR, two Thompson sub-machine guns, four M-1 Garand rifles, and seven .45 caliber pistols. ; Propulsion two 600 shp Packard diesel engines, two shafts.